Click Here to see all rental categories now! 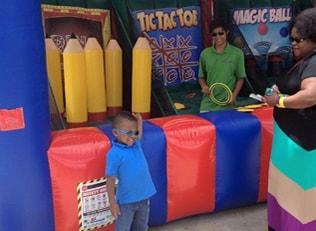 At Jumpin Jacks, we strive to provide our customers with safe, reliable, clean party and rental equipment. We offer a hassle free, one stop planning and shopping spot for all of your party or event needs. Safe: Our inflatable units are insured and inspected by the state of NC. Reliable: A good percent of our business over the years comes from referrals. Accuracy, dependability and safety are a top priority. Service: We deliver to the following cities: Charlotte, Matthews, Indian Trail, Monroe, Fort Mill, Concord, Huntersville, Mooresville, Davidson, Gastonia, Belmont, Mt. Holly, Pineville, Harrisburg, Weddington, Waxhaw, Mint Hill, Lake Wylie, Tega Cay, Cornelius, Kannapolis, Rock Hill, and Lake Norman. 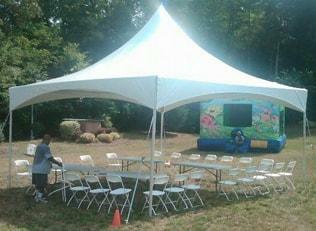 Charlotte Party Rentals: You have decided to have a party, but still donÃ¢â¢t want to have hours of planning to do. You still need to put your forty hours in at work, and you want to actually rest during the evenings. See What's New at Jumpin Jacks! 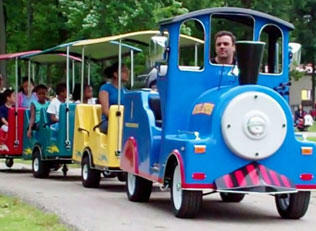 Every little kid dreams on going on a party train ride, and now kids and adults will love to wave goodbye as they chug along the road in one of our trackless train rentals. Our trained "engineers" will make sure everyone in your birthday train party have an enjoyable and safe ride. This is the perfect start to hosting your own carnival theme party with the Inflatable Carnival Midway & a favorite for School Carnival Events. The Carnival Midway includes games for 4 people to play at the same time and plenty of built in rings and places to display your prize items. Rent the Mechanical Bull for your next corporate or church function, birthday party or special event. 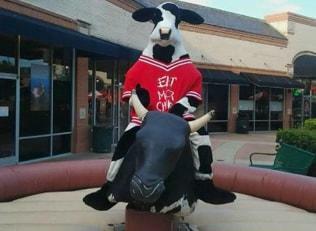 The Mechanical Bull is available for rent in Mecklenburg County North Carolina and areas in South Carolina. Safe enough for children, tough enough for professional bull riders! Up to 4 people can bounce at the same time in each of the four harnesses and trampolines. 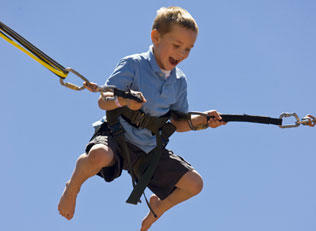 Bungee riders must be at least 4 years of age, weigh at least 20 pounds and no more than 220 pounds. Our Ultimate 4 station Bungee is equipped with the very best components. See the video! 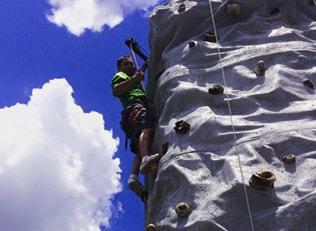 Jumpin Jacks Party Rentals 25 Foot Rock Climbing Wall is one of the few to offer a climbing wall with four climbing stations meaning four players can climb per turn, and a newly designed, realistic climbing surface. It is specifically designed to accommodate the full range of climbers. Create your own elegant outdoor party space with a complete tent, table and chair setup from Jumpin Jacks! Let one of our party pros help you design an outdoor environment that will comfortably seat all your guests and provide convenient shelter from inconvenient weather. We'll rock your party!